Freeze pops are the perfect summer treat and I’ve been dying to use these Zipzicle pouches that make it so easy! 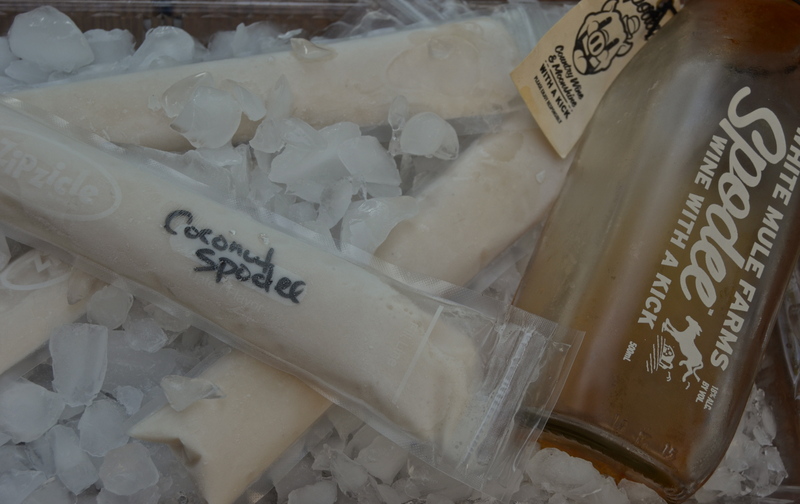 I was lucky enough to get my hands on a bottle of the new Spodee white from White Mule Farms. I am a fan of the red and thought the white would be perfect for summer cocktails. The Spodee white is blended white wine fortified with high proof alcohol. It is light and fruity with notes of pineapple, amaretto, and toasted coconut. I had an extra can of coconut milk laying around and figured it would be the perfect compliment to the Spodee white. These will definitely help you cool off in the summer heat! Combine all ingredients in a bowl and stir until sugar is dissolved. Place freeze pop pouches in a tall glass to make it easier to fill. Use a small funnel to fill pops and freeze. makes approximately 4 with a little extra to fill a pouch half way. These look great! I will have to try and make them for a summer gathering soon.